In October, Matjana Preschool was visited by Dudu Hlophe, early childhood education coordinator for the Ministry of Education in the Shishelweni region of Swaziland. I spoke to Mrs Hlophe and Matjana’s head teacher, Ncobile Mbonane, about the visit. 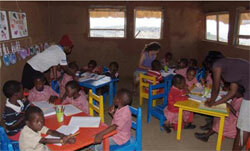 “When we registered with the Ministry of Education in June 2007, we were told that the preschool would be inspected. This is a normal part of registering a school. 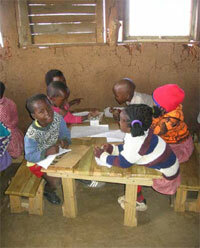 The Ministry of Education want to ensure that the facilities meet their requirements,” Ncobile told me. So it was perhaps a blessing that Mrs Hlophe and others from the Ministry turned up unannounced- there was no time to sit around panicking about the impending visit. “We have been touring the region surveying all schools and inspecting the schools which are newly registered and those yet to register,” Mrs Hlophe told me. This is part of the Ministry of Education’s effort to further regulate early childhood education in the country and establish where preschools are and are not available. I received a phone call from Ncobile on the night of the inspection- she proudly reported that Matjana Preschool had passed the test. She also told me that she wasn’t even nervous when the inspectors turned up unannounced (although I’m convinced that was a lie!). I then phoned Mrs Hlophe to ask her what she thought of the school. We’re all extremely proud to be compared to a “town” school- not because it’s a competition but because we believe all kids deserve a great education early on in life– regardless of where they live. Matjana Preschool has come along way since its beginning less than two years ago, when I imagine Mrs Hlophe would probably have compared us to a rural school and found a few things that needed improving– including the old desks. And the school would not be where it is today without the support of our many sponsors- without your money, time and energy, we wouldn’t even be able to pay our teachers basic allowances. We certainly wouldn’t have beautiful, brand new desks and chairs, a world class swing set (you’ll hear more about the epic adventure of an American family who came to build this for us in a future edition of the newsletter), books, toys and all the other things that ensure the education at Matjana Preschool is high class. We thank you all very much for your support and hope you feel just as proud of the “town” preschool you have helped us build in rural Swaziland.